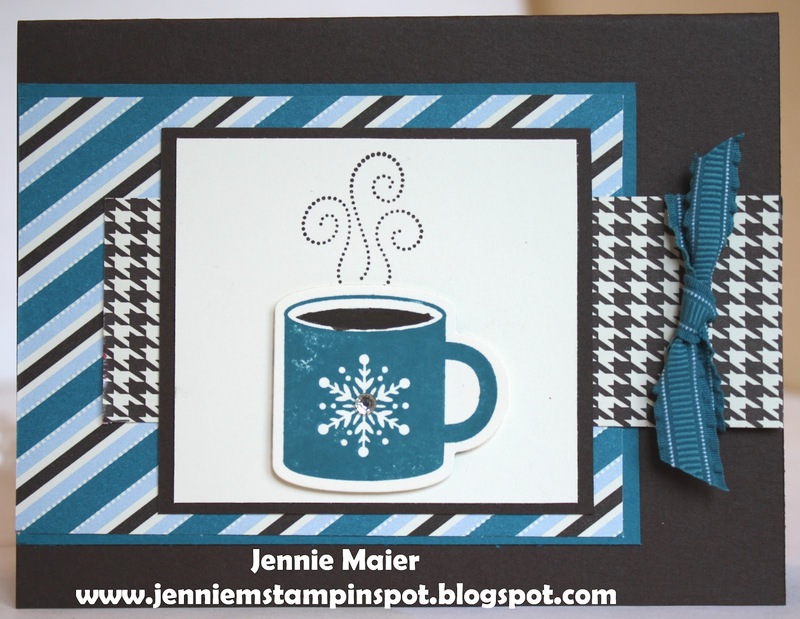 This cozy card was made for the Splitcoast Sketch#400 here. 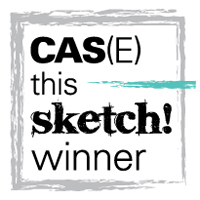 We were to use any of the other 399 sketches so I chose Sketch#246. 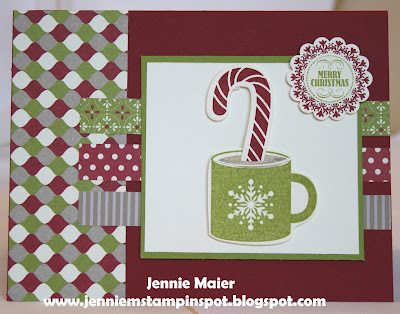 I used the Scentsational Season stamp set and Holiday Collection Framelits. The papers are from the Festival of Prints DSP. 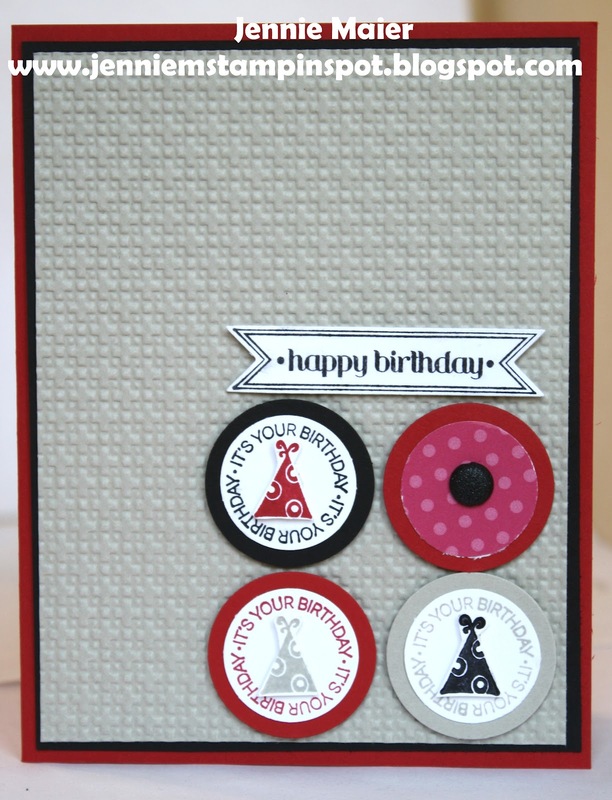 Here's a quick card thanks to the Clean & Simple FTL#204 here. I used the 1 3/8 inch and 1 inch Circle punches on the Festival of Prints DSP Stack. 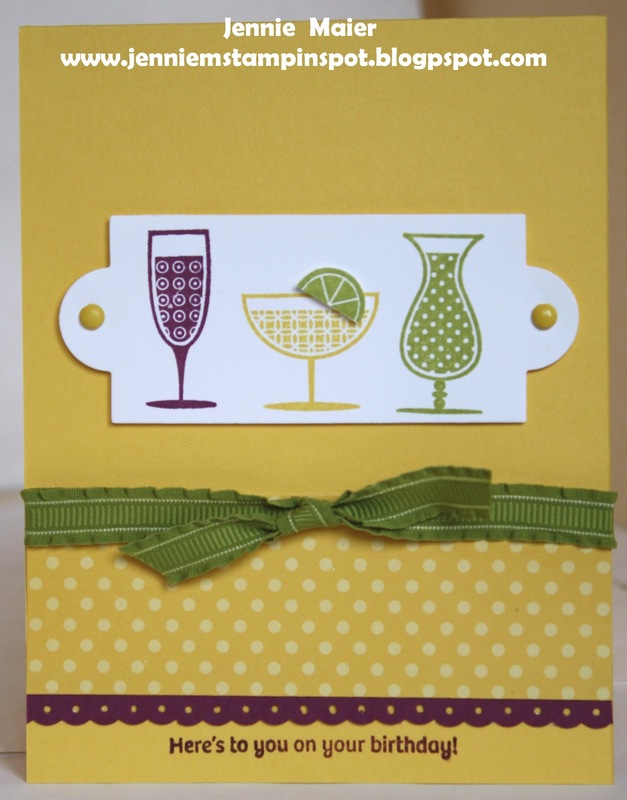 The greeting is from Embellished Events. I used the Splitcoast Color Challenge#390 here for this cheerful card. 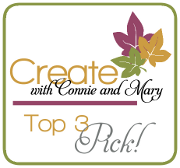 The colors to use are Daffodil Delight, Lucky Limeade and Rich Razzleberry. 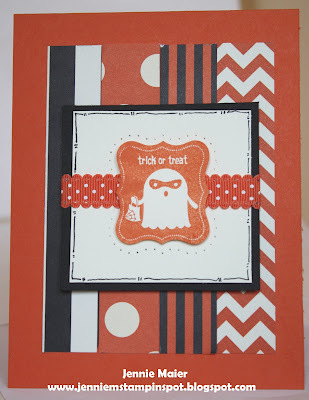 I used the stamp set, Happy Hour and some DSP Brights stack. 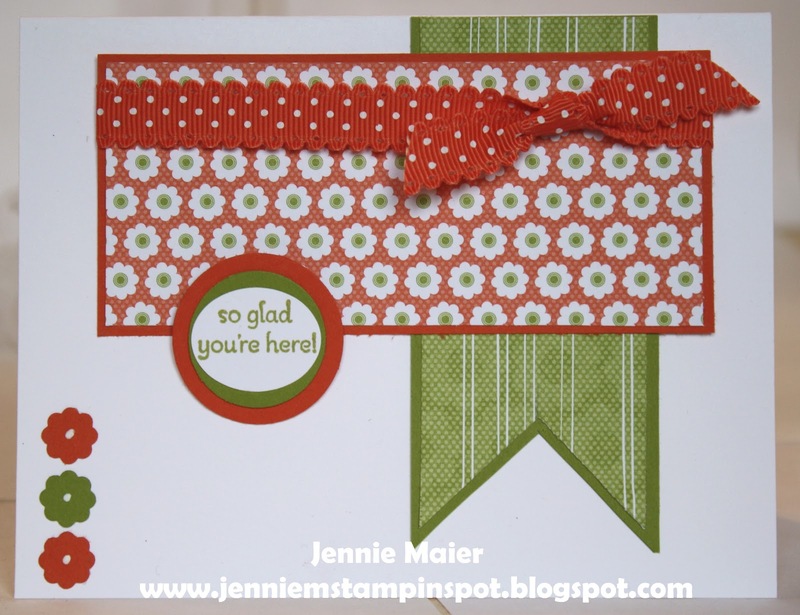 I used the Stamping 411 Sketch#270 here for another welcome card. 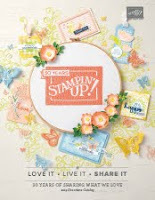 The stamp sets are Petite Pairs,Happy You, and Mixed Medley from the Holiday Catalog(Hostess set). Don't polka dots just make you happy? 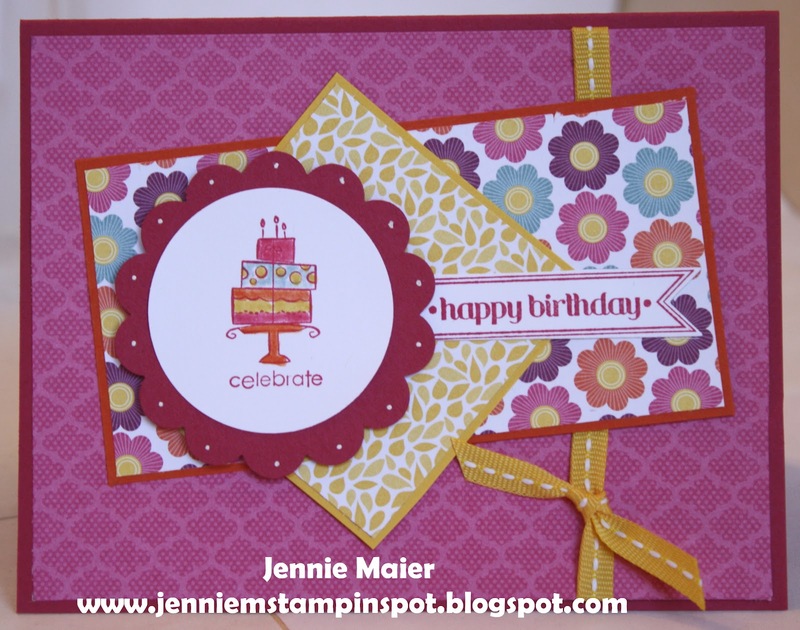 This bright card was made using the Create with Connie and Mary Sketch#215 here. 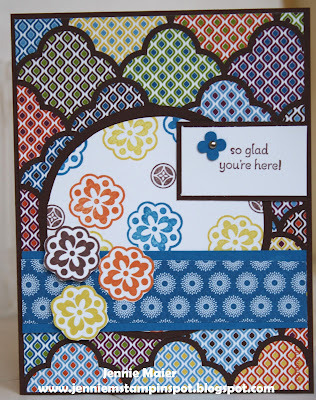 I used the Petite Pairs stamp set and some International Bazaar DSP. 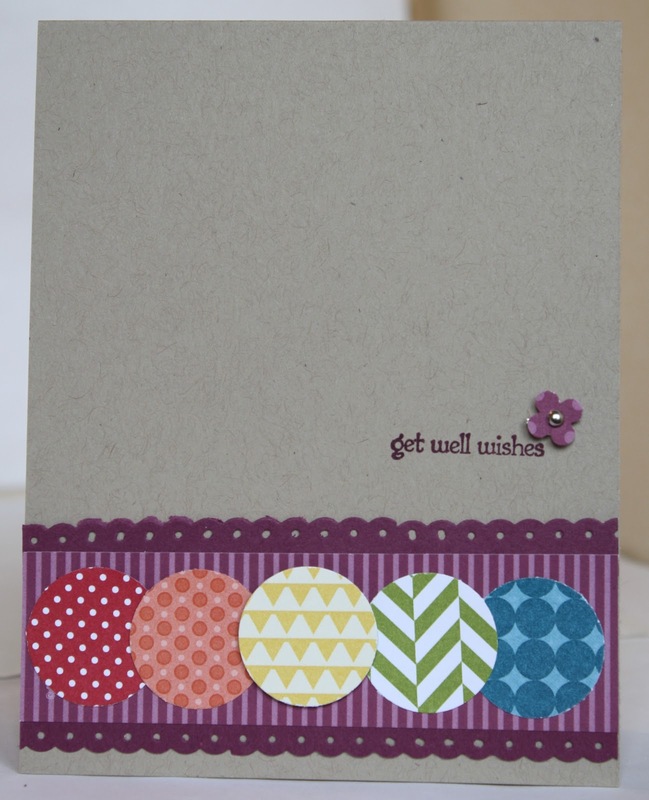 I also used the Apothecary Accents Framelits and coordinating Essentials Paper-piercing Pack with the Stampin' pierce mat. I used the PPASketch#141 here for this Halloween card. 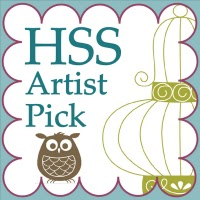 The stamp set is the new, Tricky Treats and the new DSP, Howlstooth and Scaringbone DSP. 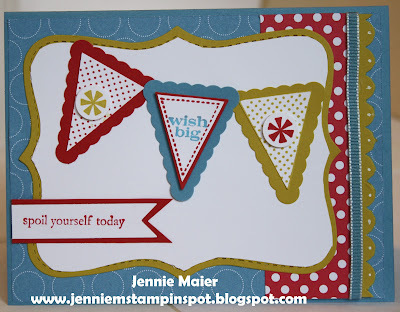 I also used the new, Paper-piercing pack essentials with the Stampin' pierce mat. This card came together really quick thanks to the Freshly Made Sketches#49 here. 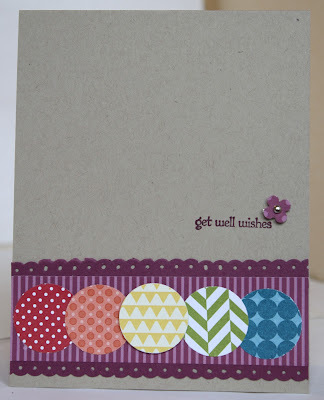 I used the Teeny Tiny Wishes stamp set and some Summer Smooches DSP and Brights Patterns DSP Stack. 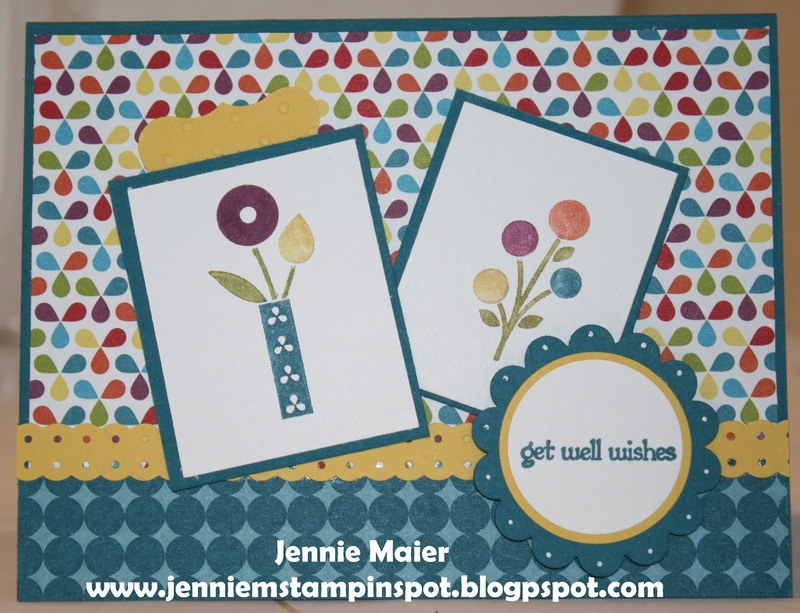 I used the Stamping 411 Sketch#269 here for this get well card. 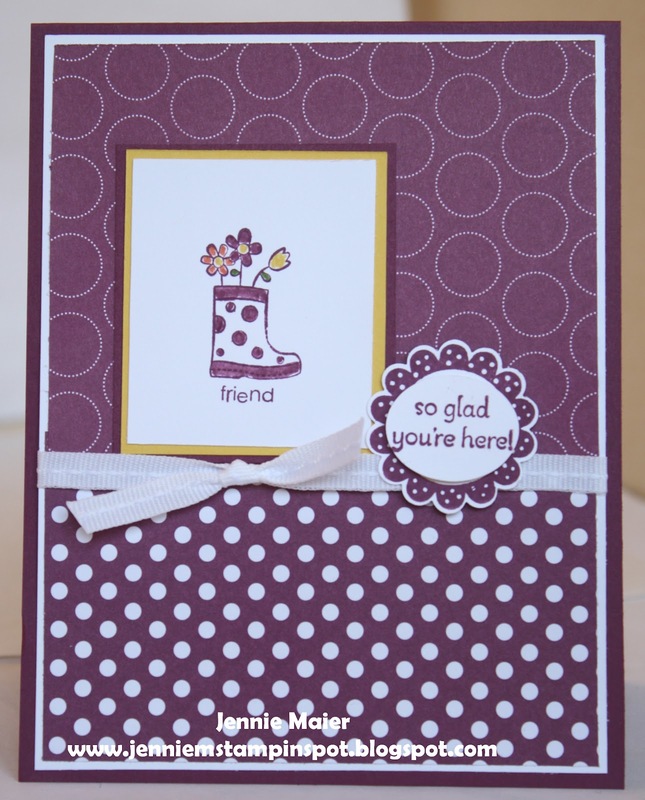 Bright Blossoms and Teeny Tiny Wishes are the stamp sets and Summer Smooches is the DSP. This card uses the Splitcoast Sketch Challenge#398 here, along with the Create with Connie and Mary Color Challenge#214 here. 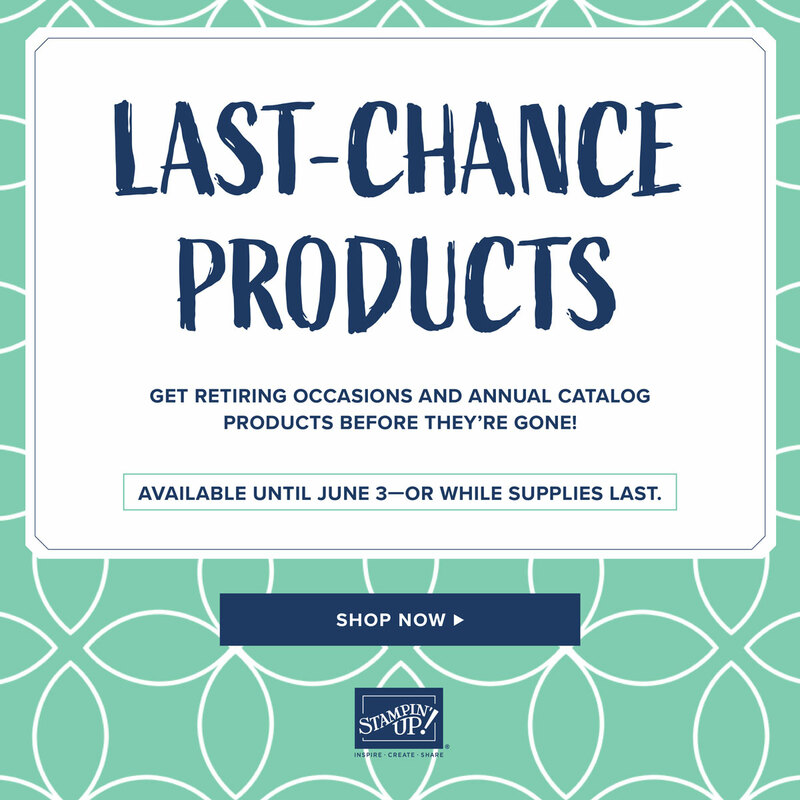 The colors to use are Midnight Muse, Daffodil Delight and Gumball Green. 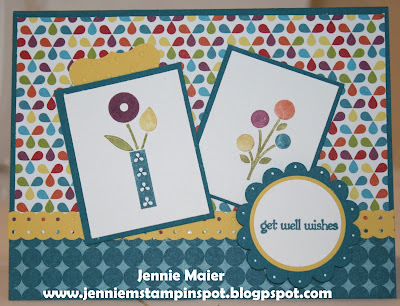 I used the Fruit and Flowers and Petite Pairs stamp sets, some First Edition Specialty DSP, the Fancy Fan embossing folder and the new Apothecary Accents Framelits with some punches too. 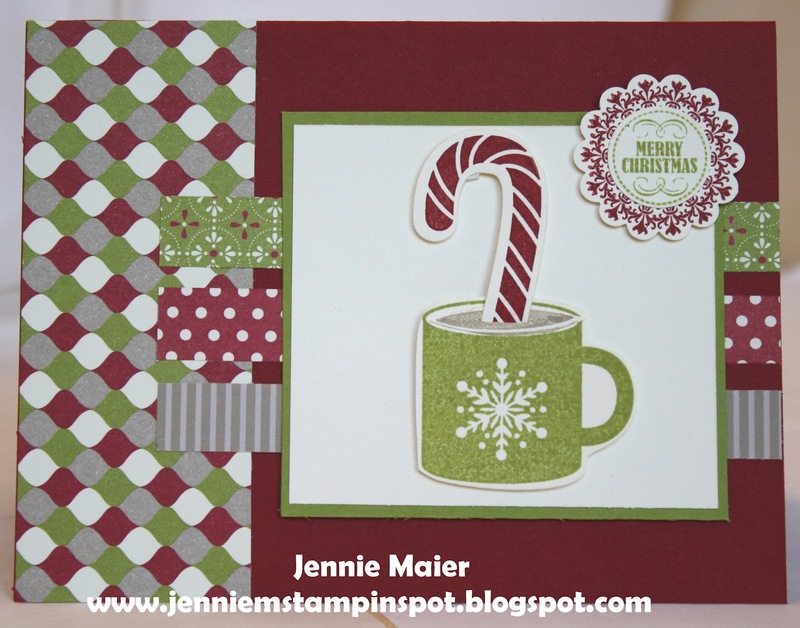 My Holiday Catalog goodies finally arrived so I had to use all the cute stuff and used the Freshly Made Sketches#48 here. 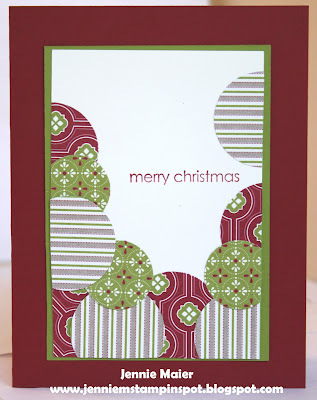 Here's all the new stuff: Scentsational Season stamp set with coordinating Holiday Collection Framelits Dies, Festival of Prints DSP Stack and the Hostess Set, Mixed Medley and coordinating 1 1/4 inch Scallop Circle punch. 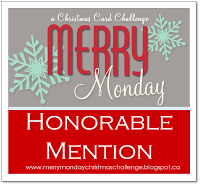 I used the MojoMonday Sketch#254 here for this welcome card. The stamp set is Petite Pairs and the papers are from the Floral District DSP. I made another baby card but used the Stamping 411 Sketch#268 here for this one. 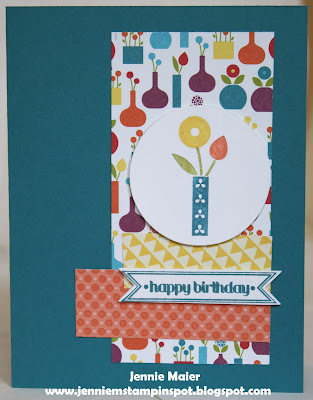 I used the stamps set, A Fitting Occasion and Itty Bitty Banners with some Brights Designer Series Paper Stacks. I was inspired by page 100 in the Idea Book. 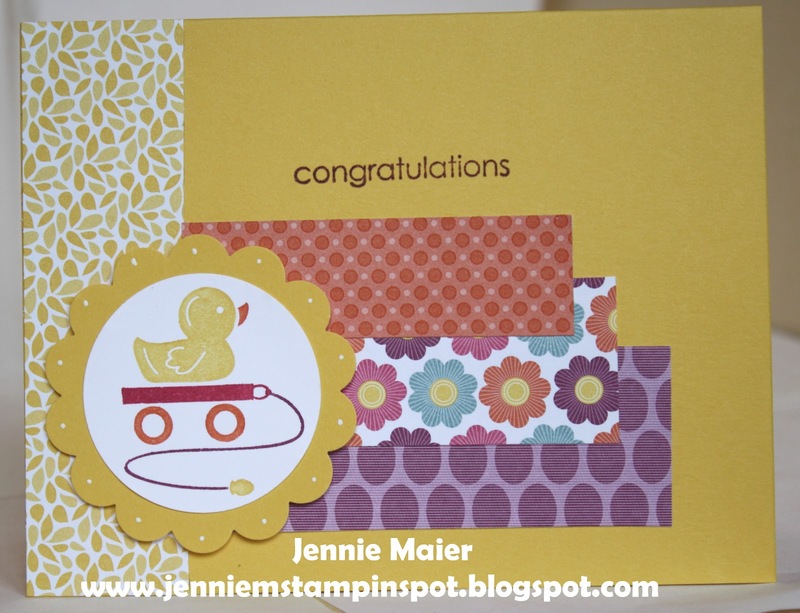 I used the Create with Connie & Mary Sketch#213 here for this baby card. Embellished Events is the stamp set and the papers are from Floral District and Summer Smooches DSP. 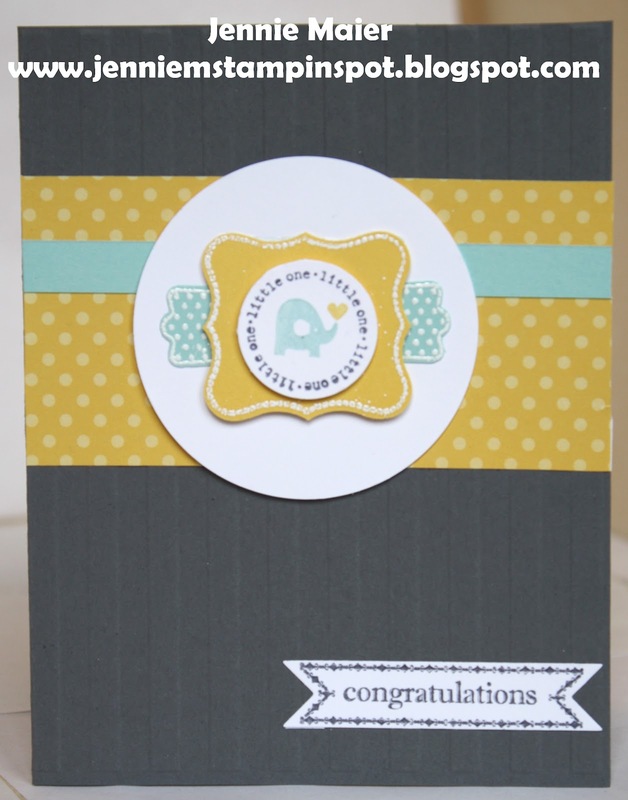 For this welcome card I used the Splitcoast Card Sketch#397 here. The stamp sets are Petite Pairs and Circle Circus and then International Bazaar DSP. 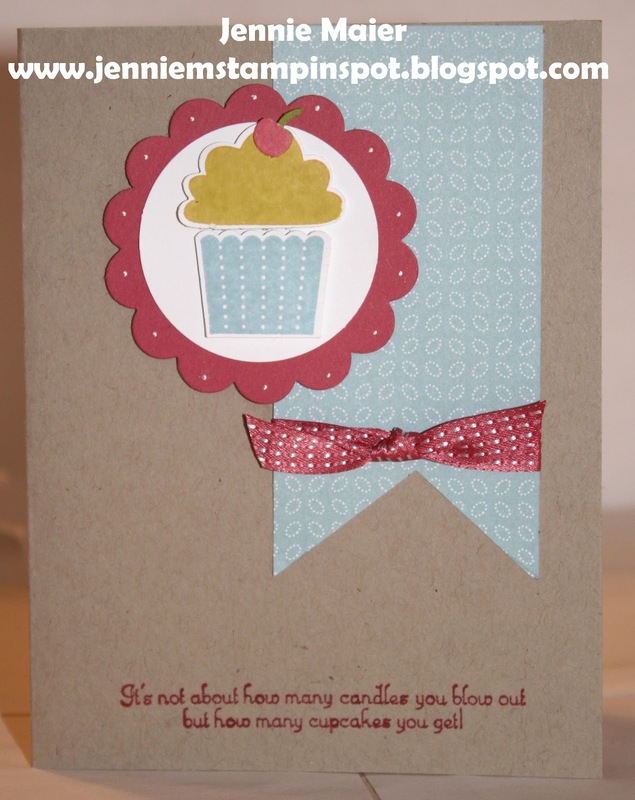 This card used the Freshly Made Sketches#47 here. Bright Blossoms and Itty Bitty Banners are the stamp sets and Summer Smooches is the DSP. I used the Clean & Simple FTL#202 here for this birthday card. 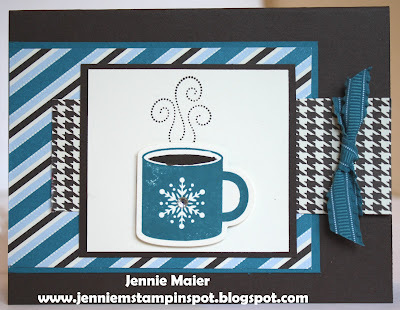 I got the color combo from the Splitcoast Color Challenge#387 here. The colors are Old Olive, Midnight Muse and Raspberry Ripple. I still need lots more birthday cards so hopefully you won't get sick of them! 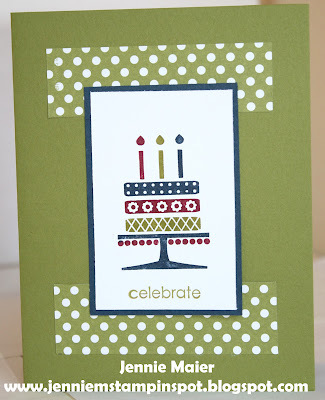 I used the Embellished Events stamp set with some Polka Dot Parade DSP. I've got my stamping Mojo going so I used the MojoMonday Sketch#253 here for this birthday card. 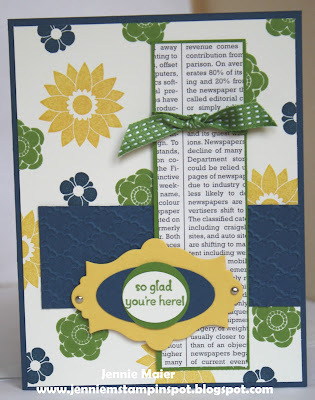 I used the hostess set, Happy You and the Itty Bitty Banners stamp set with the Floral District DSP. 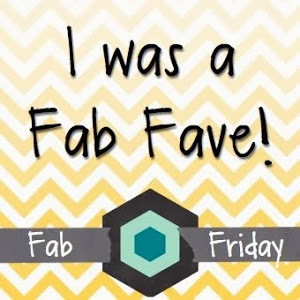 I'm making up for lost stamping time. I need to make birthday cards for Home & School so here's another one. 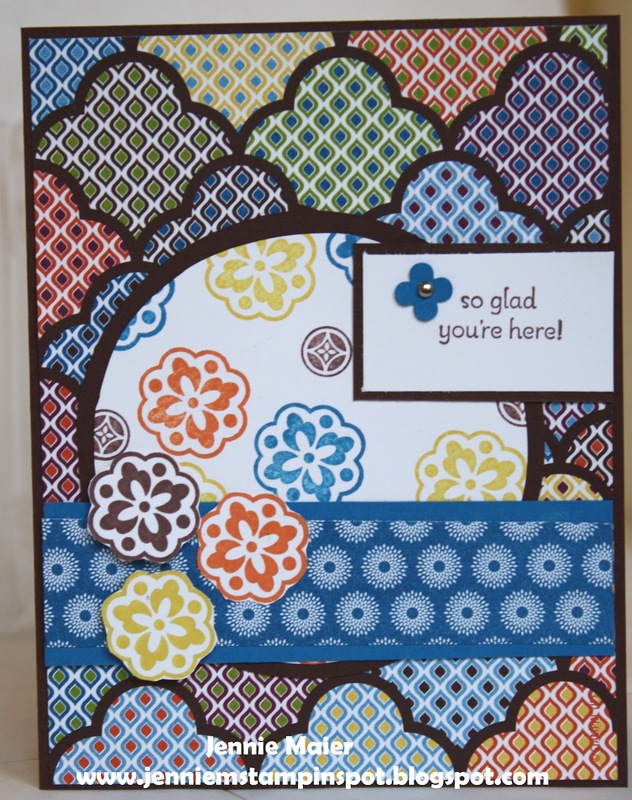 This card uses the Stamping 411 Sketch#267 here, along with the Splitcoast Color Combination#386 here. I used the Create a Cupcake stamp set with some Twitterpated DSP. I can't stand it that I haven't stamped regularly so I had to sneak into my stamping space while doing 6 loads of laundry! 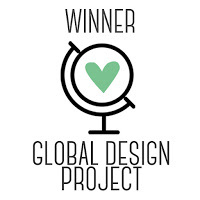 I used the Freshly Made Sketches#46 here and the PPA#140 Color Challenge here. The colors to use are Real Red, Marina Mist and Summer Starfruit. I used the Pennant Parade and Bring on the Cake stamp sets with the Polka Dot Parade DSP.